Depending on your content strategy, you can make content inaccessible to users on your WordPress site. There are a number of ways to prevent site visitors and unauthorized users from accessing content on your site or viewing all or some of your posts and pages, while also giving access to the content to others. In this tutorial, you will learn how to use WordPress content protection features and other options and methods that use WordPress plugins to protect content and download files. Complete the step-by-step tutorial below to learn more about creating private and password-protected posts and pages using the WordPress built-in content protection methods. There are a number of ways to protect content on your posts and pages from being accessed by site visitors or unauthorized users. This method is more about ‘hiding’ your file inside a deep-nested post or page than actually ‘protecting’ it from unauthorized users. Hide the post from your navigation menus and site map. This method should only be used for files or content that wouldn’t matter too much if someone who was not an intended target users were to find it. For example, let’s say you present at a business networking event and decide to make the presentation slides or notes available to event attendees after the event. It wouldn’t really matter if someone who did not attend the event came across your download file. Using a deep-nested page, hiding it from your site’s navigation menus and sitemap, and sharing the URL only with event attendees, then, would be an appropriate method to use in this instance. WordPress lets you easily create a password-protected post or page, so that only those people with the correct password can view the content on that specific post or page. 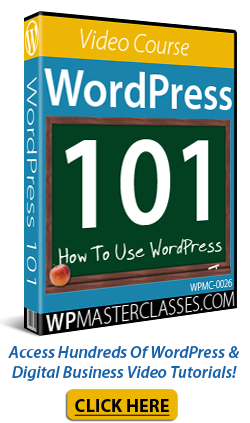 WordPress displays the word “Protected” to site visitors before the title of your password-protected Post or Page, and a password form asking users to enter the password to access the content. 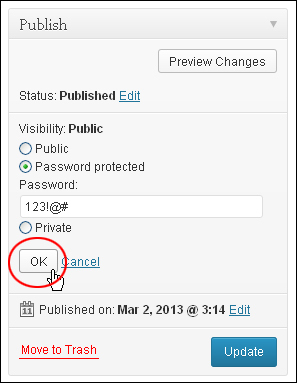 Only an Administrator, Editor, or the post’s Author can change a post’s password or visibility setting. 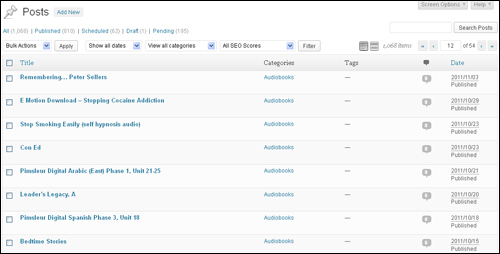 To access the “Visibility: Edit” link, go to your Posts or Pages screen, find the Post or Page you want to edit and click on the Quick Edit link. 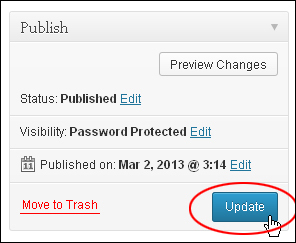 (Tip: Use this method if you ever forget a Post or Page password). When password-protecting many Posts or Pages, WordPress will store your password in a browser cookie so your site visitors don’t have to re-enter passwords if they visit the same page a number of times. Also, if you add the same password to multiple Posts, the user will only have to enter the password once to access every post, except if two or more posts use different passwords. Because WordPress only tracks one password at a time, if two or more posts use different passwords, users will have to re-enter the password if they visit a Post that requires a different password to access the content, and then they try to revisit the previous post. If you want each user to have his or her own password, then you will need to set up your site so that only registered users are allowed to view your content. 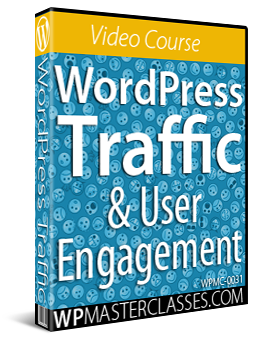 This can be easily done using plugins that turn your WordPress site into a “membership” site. 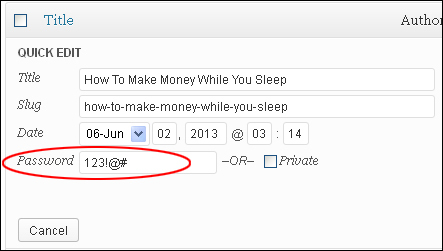 2) All content on the Post or Page is protected. 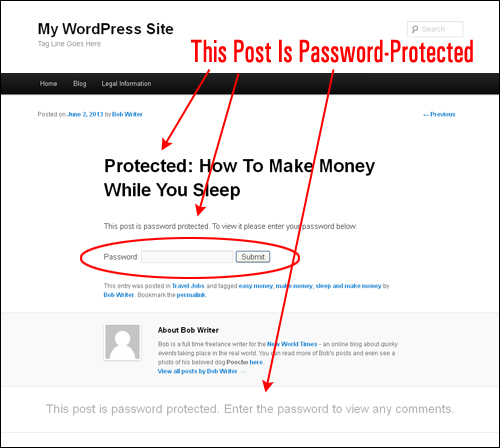 When you password-protect content on WordPress using the native WordPress function, everything on your Post or Page is protected. If you want to make some or most of the content on a Page or Post visible to everyone while protecting some part of it so that only those with special access can view it, there are plugins that you can install on your WordPress site that allow you to provide “partial-content” protection to site visitors. The Password Protect plugin can also be used to hide information inside other shortcodes, such as video embeds and file download links. 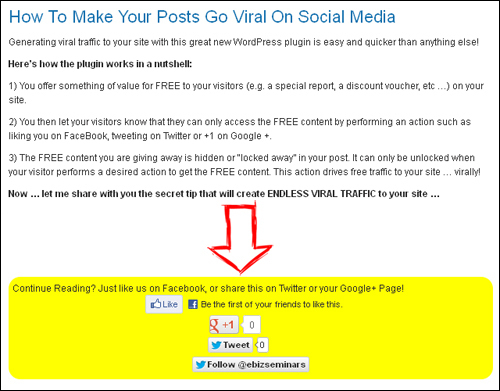 Social Locker allows you to offer something of value for free to your visitors (e.g. 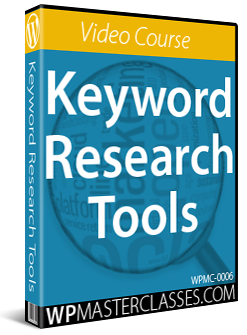 a valuable tip, special report, a discount voucher, etc …) on your site. Your special content is hidden or “locked away” in your post and can only be unlocked when your visitor performs a desired action to get the free content such as liking you on Facebook, or posting a tweet about your site on Twitter or +1 on Google +. 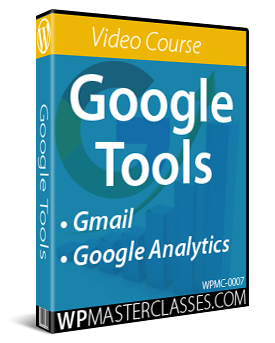 This action then helps to drive free traffic to your site … virally! 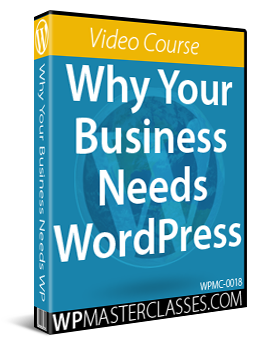 If you use WordPress for e-commerce, most plugins, solutions, and services will have built-in content protection features. Note: It’s practically impossible to prevent people from stealing content that is visible on your site (e.g. text and images). The web was designed to share content online. The plugins presented below will simply prevent those who really can’t be bothered to dig deeper into the source code of your pages. In addition to locking and hiding content, there are also plugins that try to prevent other people from copying / stealing your content. 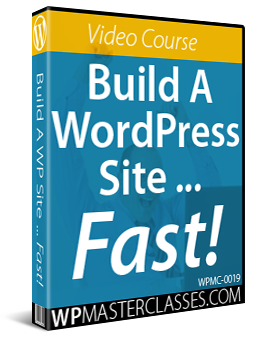 For example, a Free WordPress plugin like WP Content Copy Protection prevents people from selecting and copying text on your site or right-clicking on your images and saving them to their own hard drives by disabling the right-clicking and text selection function on your site. If you are worried about people stealing your images, there are a few options you can look at implementing. 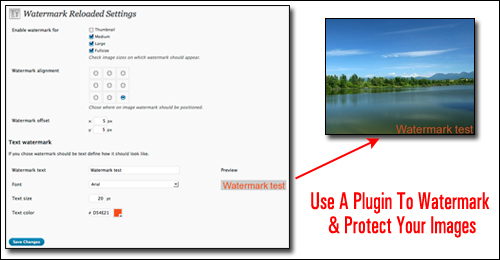 One option is to add a “watermark” to your images using a Free WordPress plugin like Watermark Reloaded. Adding a watermark lets people know who the original owner or creator of the image is, and trace the image back to the originating domain. Tip #1 – If, for whatever reason, you find yourself changing the visibility settings of most of your Posts or Pages to “private”, then install and activate the Private Post By Default WordPress Plugin. 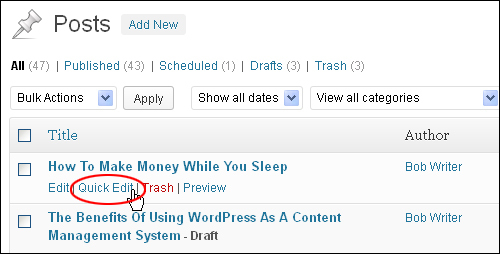 This plugin automatically sets all the Posts and Pages you create to “private” by default. 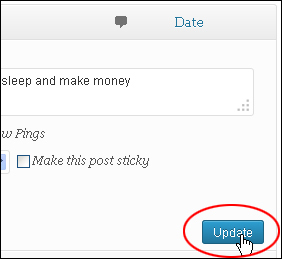 All you have to do then, is change the visibility settings of any Posts or Pages that you want to make visible on your site back to “Public”. 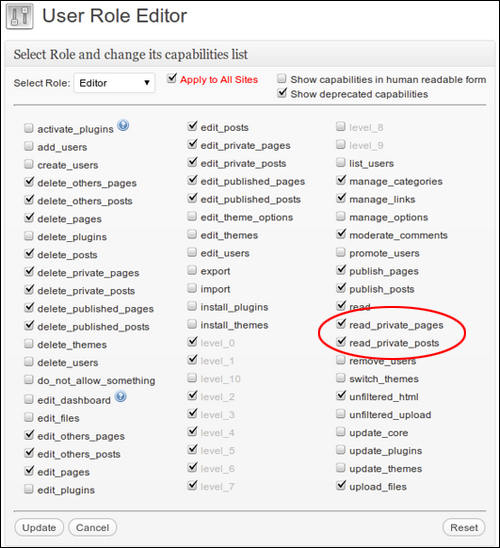 Tip #2 – As explained earlier in this tutorial, by default private posts are only visible to users on your site that have been assigned the role of Administrators or Editors. 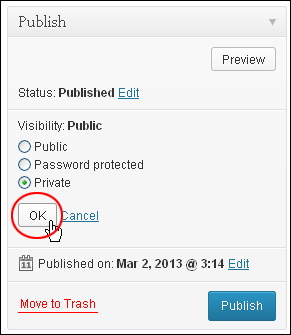 What if you want to allow users who are not Administrators or Editors to view private Posts or Pages on your site? For example, let’s say that you run a business consultancy firm and you want your consultants to be able to distribute reports privately to clients through your site, or your children’s school wants to post class assignments privately to students online through their school blog. 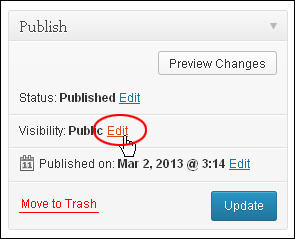 One option would be to make everyone who needs to have access to private Posts or Pages on your site into an “Editor”. 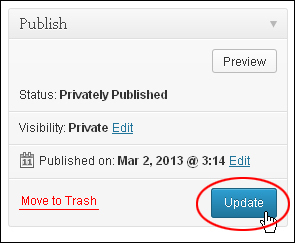 This is not a very good option, however, as they would then be able to modify your content. This would now let all registered users on your site assigned the role of “Subscriber” to access and view your private posts and pages without being able to modify the content. There are a number of other options for protecting your content online in addition to what has been presented in this tutorial, but these options typically involve messing with code on your site or server.